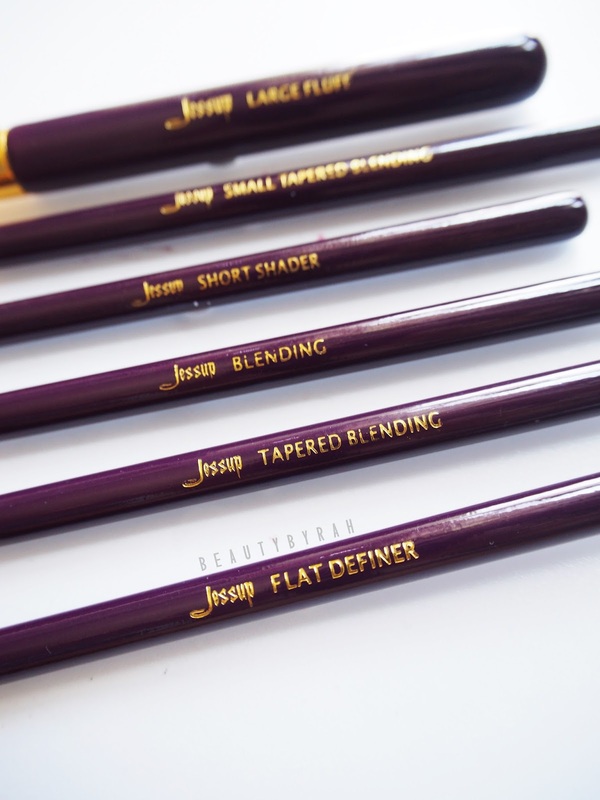 Got another review up for you today and it's all gonna be about my latest obsession, the Jessup 15 Pieces Brush Set! Firstly, purple and gold. Yes. My favourite colour and the gold ferrule just makes it look so lush. 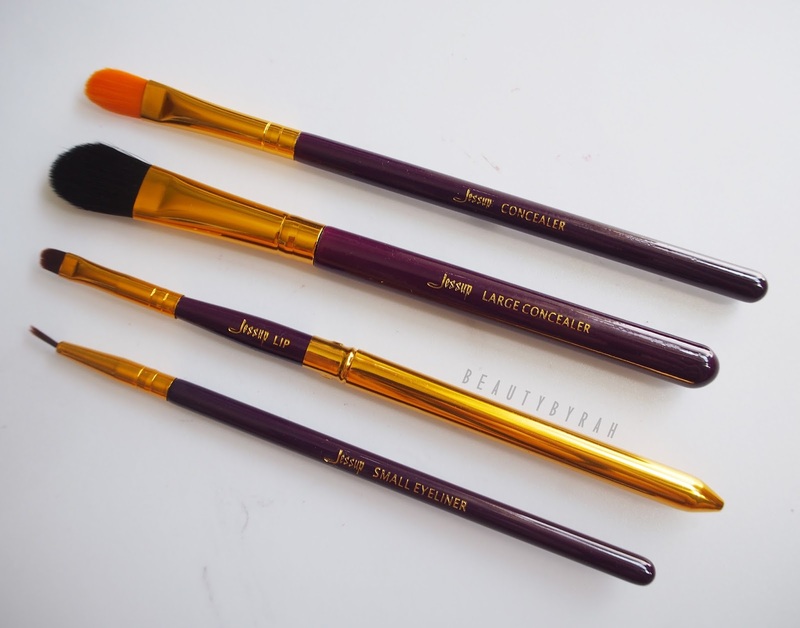 Each brush also has the supposed function imprinted on the handle in a gold font - very nice touch, if you ask me. 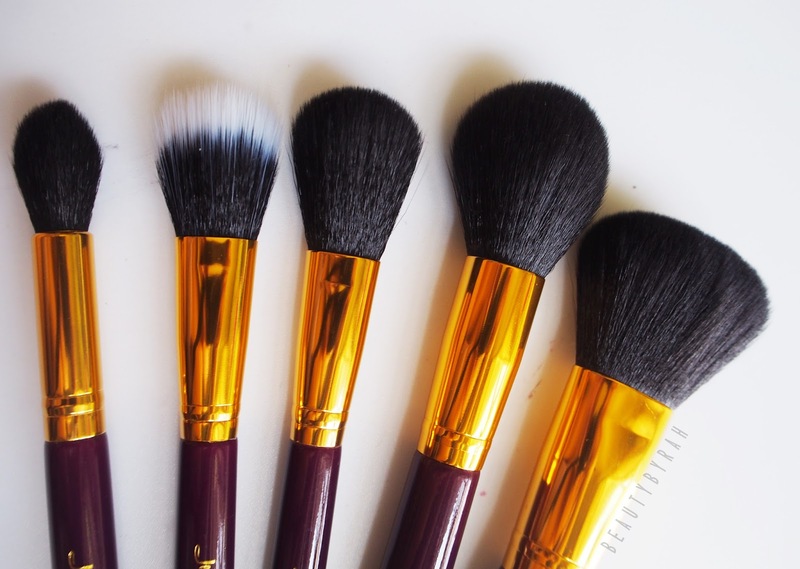 These are just guides of course, you definitely can use a brush for a myriad of functions! I have to say the face brushes alone already makes the set worth it! 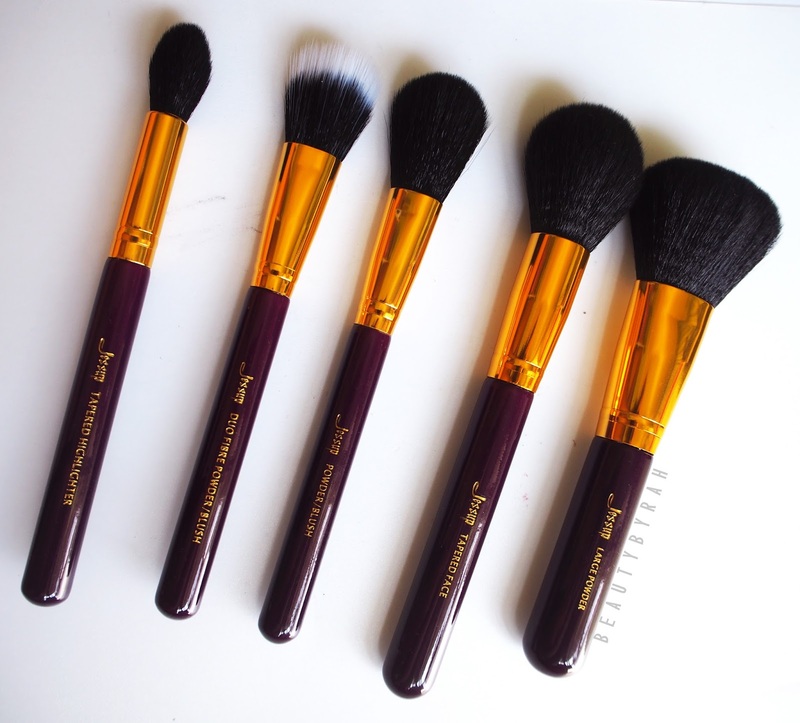 The face brushes are all super soft and the bristles do pick up product and deposit it on the skin nicely. One thing to note though, after close inspection, I do realise that the bristles for the tapered face brush wasn't too well cut as the length of the hairs weren't too even on both sides. 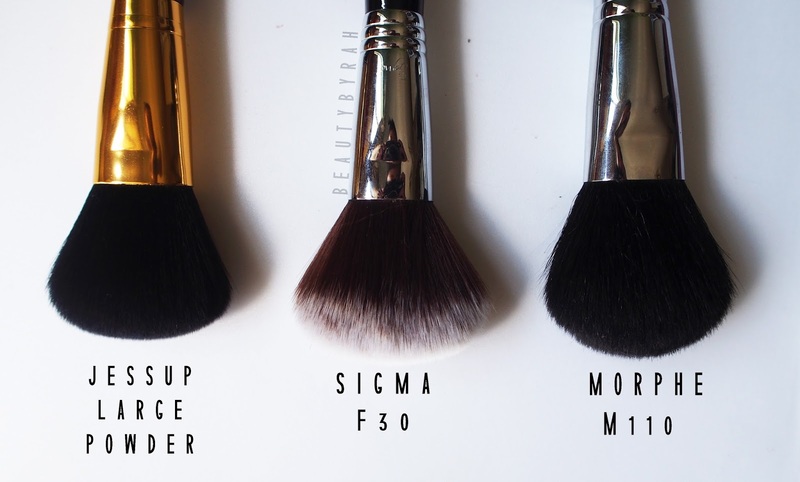 However, it isn't too major and I do feel that it doesn't affect the function of the brush if you're just using it to set the face with loose powder (which I do). 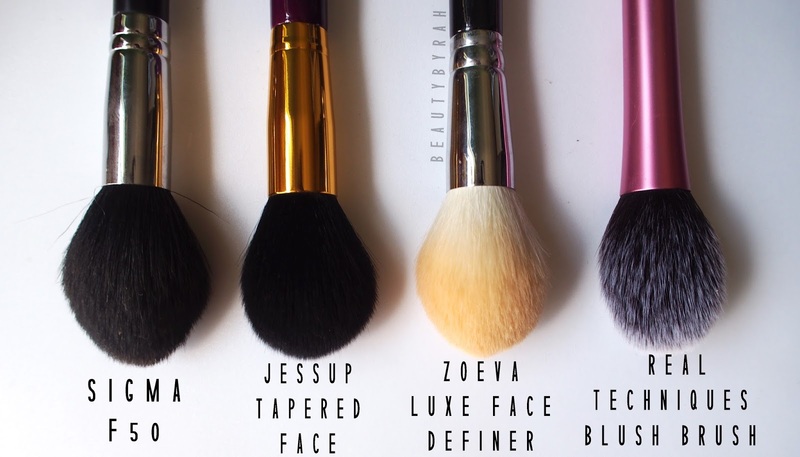 Overall, definitely thumbs up for the face brushes! 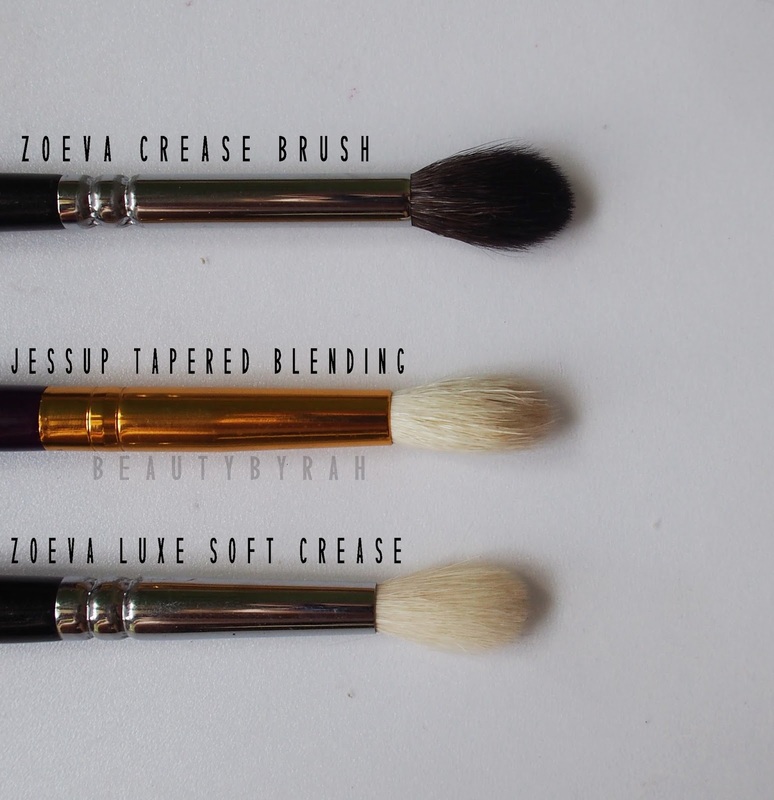 The only 2 brushes which I felt were scratchy from the bunch are the Tapered Blending brush and the Blending brush. 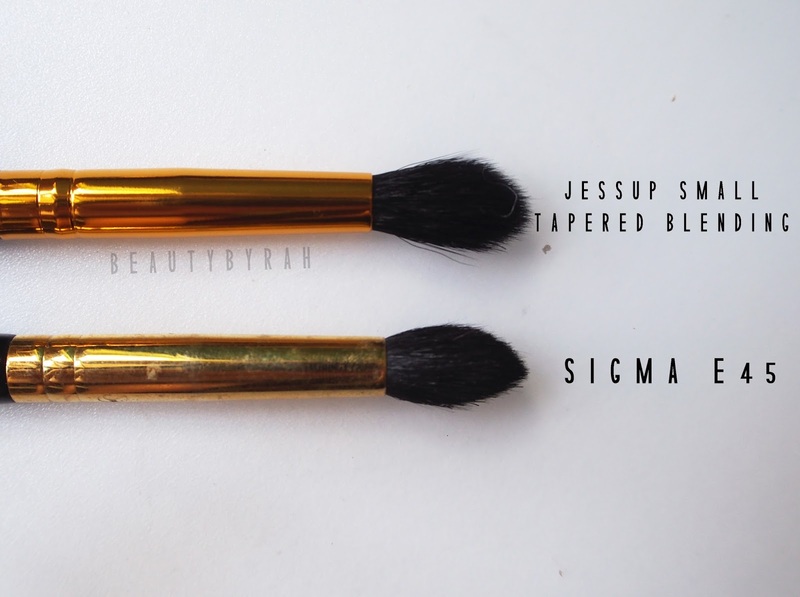 These are the only 2 brushes from the set that use natural bristles and they are scratchy on the eyes. So, I do not use them for those purposes. 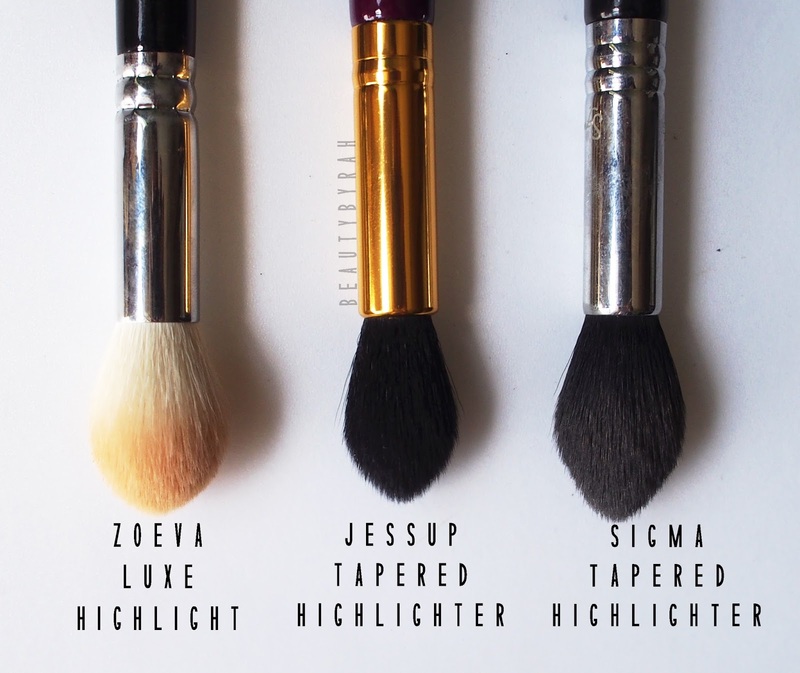 Instead, I use the Tapered Blending brush to apply highligher precisely on top of the cheekbones and the Blending brush to contour the sides of my nose. Problem solved! Feast your eyes on the photos! 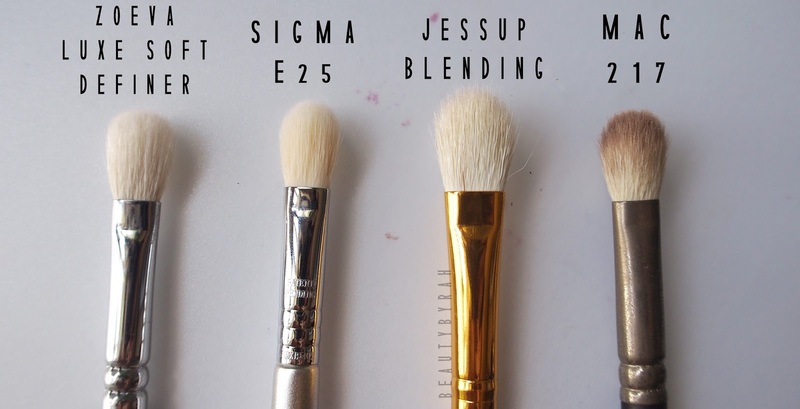 Here are some comparisons with my other brushes so you get an idea! 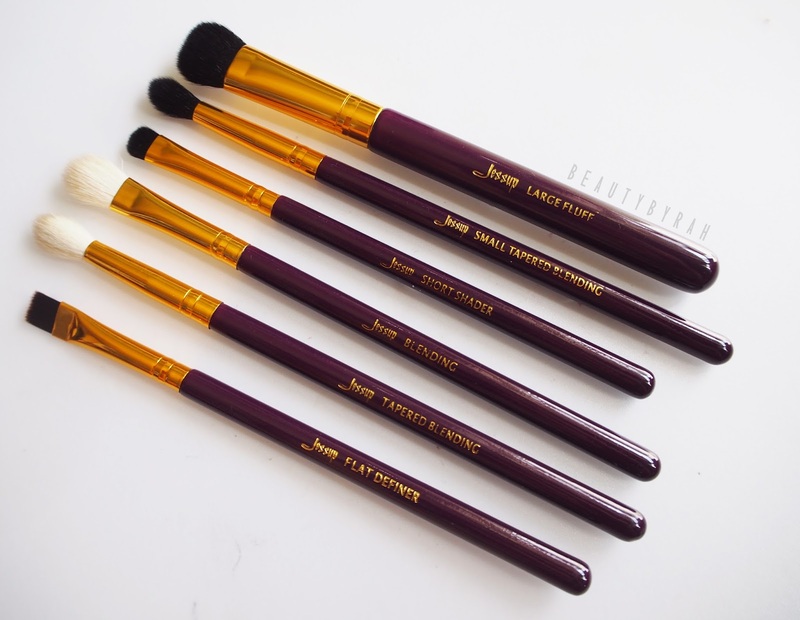 Overall, I have to say this brush set is really amazing for its affordable price point! 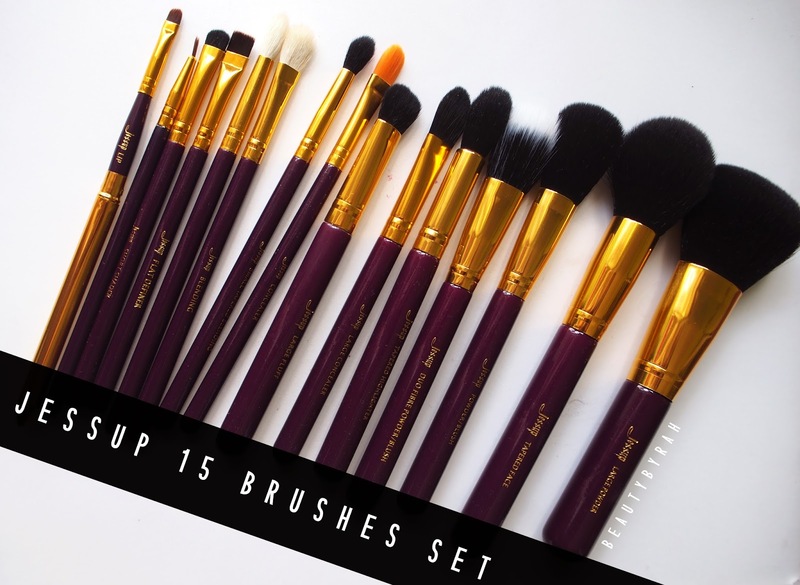 You get 15 brushes for SGD$24 (USD$18), so one brush is at a whopping price of SGD$1.60 (USD$1.20)!!! They have other colours too, if you're not a fan of purple (if so, we can't be friends, really.) - black/white handle with gold/silver ferrule. I got mine off ebay which you can check out here. Shipping is free, but it take about 3 weeks or so to arrive. 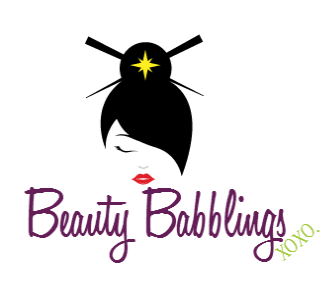 I highly recommend this to everyone, a makeup beginner or a junkie (like me). 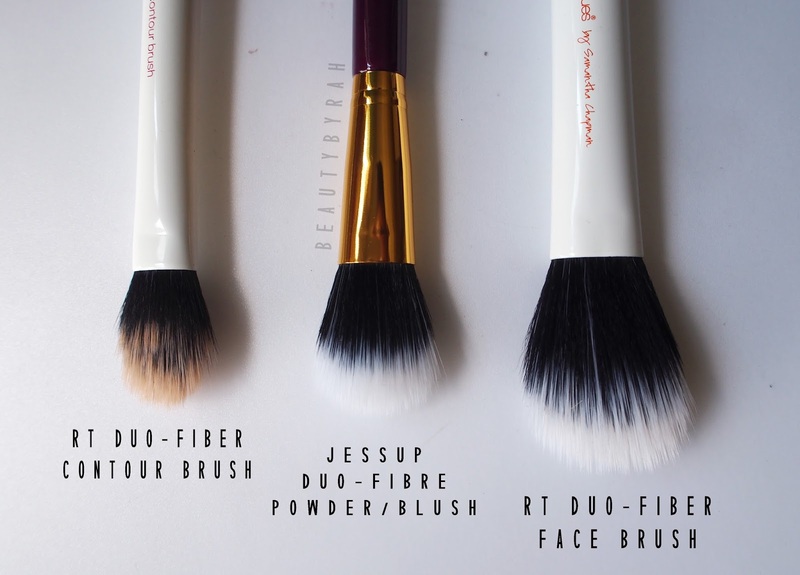 Besides, brushes are always a good investment! Hope the review and photos were helpful for you! 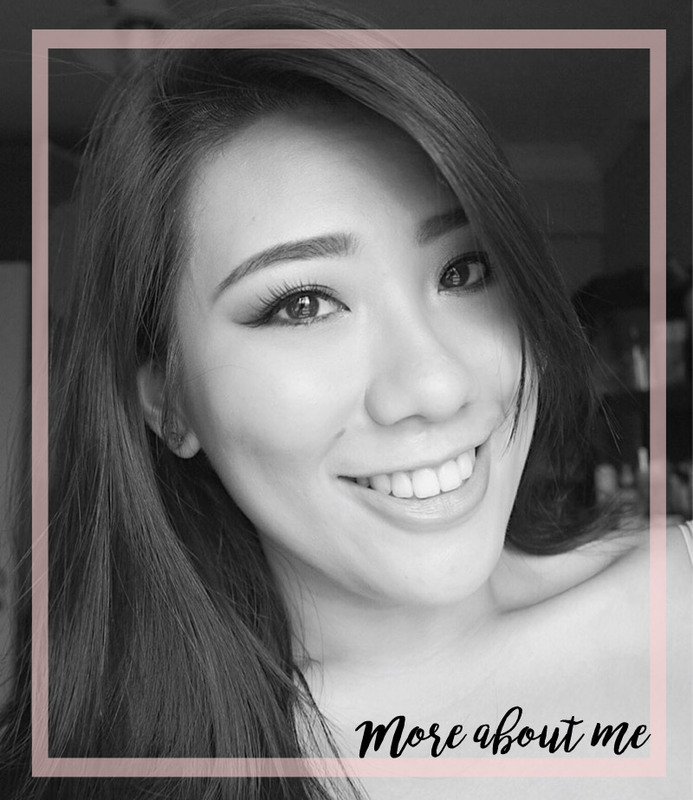 Thanks for dropping by and have a great day ahead!Xo.